creative savv: How do you spend Boxing Day? How do you spend Boxing Day? When I was growing up, Boxing Day was the big after Christmas clearance sale at US stores. My mom stocked up on gift wrap, bows and cards on that day. For me, I prefer to take a day off, and not go out shopping. On the 24th, I stopped at the public library and checked out a stack of back issues of Martha Stewart Living and The English Garden magazines. I'll be spending today with my nose buried in magazines. I do this one day per year. We eat leftovers from the previous couple of days of cooking, and kids have always been very entertained with their new belongings -- the perfect set-up for me to have time to myself. Thanks, Belinda! I hope you have a relaxing day today with your daughter! I am planning on working in the garden. I have bulbs to plant. They had to be pre-chilled for 10 weeks; it's been 11 weeks now and it's time to go in. 850 bulbs to plant and I worked for hours yesterday afternoon and put in 56. I think it's going to take a while. . . . I'm thankful for a spade that has inches marked on it; it makes the job easier. But if I didn't I could always use a ruler in the holes. The trash man comes today, so I think I may also prune the grape vines a bit. I did that earlier this week too. Come January, I have a lot of fruit trees to prune, and the trash cans are quickly filled, so anything that I can prune now helps me to have room in the trash cans later. I imagine he'll be late today because of everyone's Christmas trash (that's usually the case) which will give me a bit more time, though I really want to spend most of the day planting bulbs. I cooked a ham yesterday and sliced it and some bread for sandwiches today, so that will make a simple lunch, and we have some baked potatoes left that we can dice for breakfast, so I'll just have to make dinner and some crackers for snacks today (I made a cheese ball yesterday). it sounds like you have a very active day ahead of you! I hope your weather is pleasant and you can enjoy being outdoors! I saw bulbs still at the hardware store the other day, and I thought to maybe pick up a few to plant. I may still do that, if they mark them down more. I never remember what Boxing Day is supposed to be. Educate me! Well, here we are digging out from the snow once again ... whew ... 6" last night, 5" the day before, 5 or 6" the day before that (but my brother had over a foot of snow so we're counting ourselves lucky!). My poor parents are STILL w/o power--they live in the hardest hit county in MI. Normally I prefer to spend today cleaning up from the post-Christmas detritus--which I am doing--but my kids are in my niece's wedding this spring so we will take them to be fitted for a tux and to try to find a dress. This isn't their idea of fun so we will probably stop for something unhealthy to eat along the way. Enjoy your day and your well-earned down time!!!!!!!!!!! Oh, your poor parents! No power for so long. How on earth have they managed for so long? Do they have a generator? Hopefully power crews will have theirs restored in the next couple of days. No, taking kids for dress-up clothing was never my kids idea of fun, so a quick meal out might be what makes it seem a bit less horrid, from young kid's point of view. From what I remember, Boxing Day comes from the years that larger homes had servants. The servants worked all day on Christmas, serving/preparing meals, keeping the home clean, for the home owner's holiday celebration. So, on the day after Christmas, most servants got the day off, and a little "box" with their gift from the home owners. So, the name Boxing Day describes the receiving of the gifts by servants from homeowners. At least that's what I've always heard. Thanks! Nice Boxing Day summary. My parents will probably be without power till Saturday. To add insult to injury, they had a 3-day power outage in November due to a windstorm. They have a woodburning stove which helps, but they are running low on wood. I can't convince them to come stay here with us. Praying for earlier-than-expected relief. We have had crazy weather this month. Supposed to get above freezing Saturday so we are hoping the ice on the power lines and trees melts off to prevent further power outages. We had a productive day with my niece--my daughter has a dress and my son has been fitted for a tux (are tuxes way undersized??? They fit him for one 3 sizes up from his normal size and the shoe sizes were 2 sizes up). My niece treated us to Aunt Annie's pretzels afterwards. Hope you are enjoying your family. I just heard in the news the same forecast for your area, that temps will finally go above freezing on Saturday. Wow! That's so hard for me to imagine. Your day sounds very productive. Now you can cross the wedding clothing off your list of to-do's! Great minds think alike! I always ask for magazines as a Christmas gift so I can spend part of Boxing Day just enjoying them. This year a friend also supplied me with a large pile of them, so I am very lucky. 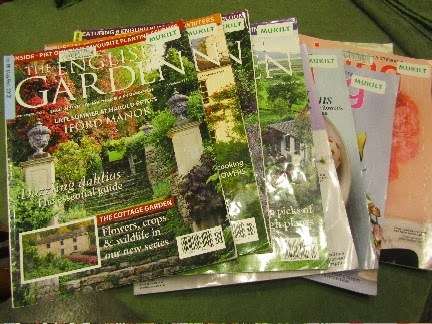 I am very envious of your English Garden magazines from the library. I've only read one of them once, and they have such great photos and ideas. Enjoy your well-deserved relaxing day! Our library has a very extensive magazine selection. I realize that I am indeed lucky. I hope you are enjoying your selection of magazines today! I went to a BBQ with friends and we ended up having a water fight to cool down because it was so hot! Then I flew back to Brisbane, where it's also hot! Welcome home, Liz! I hope you had a wonderful time with family and friends. I never even heard of Boxing Day until a few years ago, so as you might guess, I have no traditions for the day. But it was nice and sunny here with temps in the 50's so CatMan and I went for a nice 30 mile bike ride. It was WONDERFUL! Oh, what a lovely day you must have had! A nice ride, and great temps for it! Hope you had a relaxing Boxing Day. It was a lovely sunny day here so we went for a walk and kite flying. Iford Manor, which is highlighted on the front cover of your English Garden magazine, is only a few miles from my house - thanks for reminding me that I would like to go and visit there one day - maybe 2014 will be the year! oh lucky you! To live so near so many beautiful places. No sun here today, but a walk would be nice. Make sure to take a lot of photos and post them, should you visit Iford Manor!